Last updated 14 June 2016 . By Daniel Splarn. Promising "the biggest names, the hottest new acts and the best mixed bills" on the scene right now, Knock2bag is one of London’s true stand-up comedy treasures. 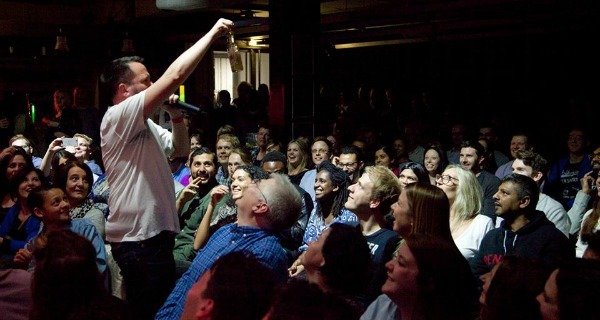 They host gigs in Shoreditch and Hackney, where the tickets are cheap and you can find a string of talented comics performing to packed out audiences. I headed to their latest show to celebrate Rich Mix’s 10th birthday, where I’d heard that the BAFTA-nominated Romesh Ranganathan was headlining. So let’s get the bad news out of the way first: Romesh had to pull-out on the day due to filming commitments, but any disappointment soon faded as soon as the utterly hilarious MC Matthew Crosby took to the stage to kick things off. Crosby nailed it from the start; his audience interaction kept the crowd going throughout and his ability to sniff out improvised comedy in between acts was spot on. 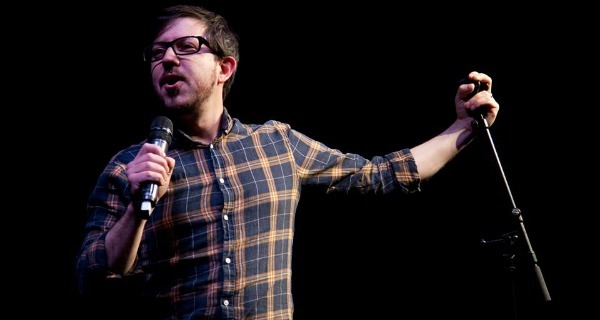 A genuinely funny comic who helped the evening flow seamlessly. This was Rich Mix’s 10th birthday and we were to be treated to a bumper line-up of ten comedians to celebrate properly. You’ll find the acts delivering short and sharp sets at Knock2bag, giving the audience the opportunity to experience a wealth of different stand-up styles as experienced performers and emerging talents each took centre stage. Highlights included sets from Lazy Susan - the hilarious double-act nominated for the coveted Best Newcomer Award from the Fringe Festival in 2014 - and Bridget Christie, a multi-award winning performer whose set was always going to be packed with laugh-out-loud moments. My favourite act of the night though was Abandoman, a duo of freestyle rappers who delivered some of the best improv comedy that I’ve ever had the pleasure of seeing. Positively buzzing with energy and charisma, these guys took mundane topics suggested by the crowd and turned them into side-splitting freestyle raps which had everybody gasping for air. As a big fan of Whose Line is it Anyway? I wondered how these guys would measure up, but they soon had me laughing as much as vintage Colin Mochrie and Ryan Stiles. Hilarious. MC Matthew Crosby was in top form to keep the evening running like clockwork. Given Rich Mix’s location in the heart of Shoreditch, I was surprised to see an eclectic crowd packed in for this birthday celebration special. This was no hipster-haven, as an audience of twenty-somethings enjoying an evening out, loved-up couples on a date night and older groups of friends all got the drinks in and took up their seats. I’d been to a pretty shocking comedy event a few weeks earlier and was worried I would experience the dreaded silence when a joke failed to land (is there anything more awkward?) but there was nothing to worry about this time around, with every act enjoying a warm reception from the crowd. With regular audience interaction, no uncomfortable hecklers and frequent short intervals so you can get the drinks in without missing any of the action, Knock2bag’s simple formula made for a successful night out. Abandoman chose to leave the stage to get up close and personal with the crowd during their freestyle set. If you want a no-fuss night out packed with all kinds of innovative comedians, you want Knock2bag. There’s great value for money on offer - my ticket was £10 - and for that you’re treated to a richly entertaining night where serious lols are guaranteed. They’re not back in Shoreditch now until 17th September, but you can still get your Knock2bag fix at Hackney’s Moth Club, where none other than Doc Brown is the headline act on Wednesday 29th June.